Today we chat with Shep Hyken -- a world renown speaker and author on the topic of customer experience, service and client management. Shep has traveled the world speaking with crowds about customers and helping companies get a better handle on their service efforts. Shep joins the CXNation today to tell his story and give us tips and advice for growing our business through the power of customer experience! 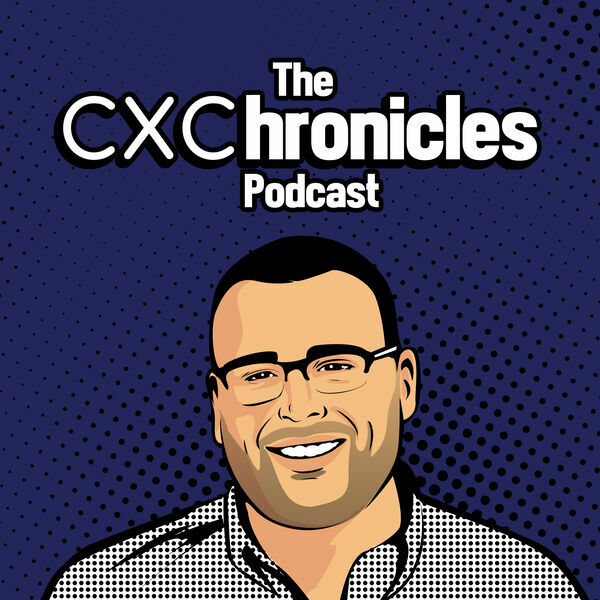 Speaker 1:0:06Hi, and welcome to the cx chronicles podcast is the show for customer service managers, vps of customer experience, and all of you other see exercise out there every week. We're going to dig into topics, challenges, wins, and updates in the cx or customer service community. I'm your host, Adrian Brady, to check us out at the cx chronicle stock and feel free to reach out to us anytime. Thank you so much for being a part of the cx chronicles nation. Speaker 1:2:26freshdesk everything you need to redefine your customer support, keep track of conversations, resolve your customer issues or customer across all channels, and increase your team's productivity. Checkout out fresh desk, fresh desk.com today. Speaker 2:2:48Oh, right. Well, welcome to the cx chronicles a today. Guys. I'm really, really excited but excited. We have shep hyken on the show. Shep, welcome to the cx chronicles a. it's great to be here. Thank you so much. No problem. So folks, many of my listeners are very well, have a very aware of who shep is. He's got a number of books, he's got a bunch of awesome training courses and materials and he literally gets to travel all over the world talking about customer experience, customer service, a customer engagement, and really just getting folks to think about how, how you need to take care of customers to really grow your business into the future. So shep, I'm so excited that you're on the show today. Speaker 3:3:28Well, I'm ready. I'm ready to share whatever I have to share. Sharing Guy. Speaker 2:3:35Let's start off with a chef. I'd love for you to take five, 10 minutes. Tell us about your customer experience, a service and sales journey. How did you get to where you are today? Speaker 3:3:45Well, we don't need to spend all that much time on it, but I'll give you a real quick background. I'll give you maybe the two minute version. How's that? Perfect. Starting when I was age 12, I had my first business at birthday party magic show business came home from my first show was paid $16. That was $15 plus a dollar tip and uh, my mom after dinner said, what are you going to do now after dinner? And I thought homework was the right answer. It was a school night. No. Um, how about, uh, write a thank you note and I wrote a thank you note to these people and my dad said a week from now I want you to follow up, call him up, thank them again and then ask them how you like to show if they said they liked it, ask them what tricks they liked the best. Speaker 3:4:28And I said, okay, great idea. And my dad said, when you start doing more shows, have you asked them what tricks they like the best of everybody says the same tricks and you know, what the tricks that everybody likes her, but if they don't talk about certain ones, get rid of them. So little did I know my mom and dad were teaching me about number one, showing appreciation to customers. Number two, getting feedback. Number three, using the feedback, process improvement. All of that is about customer service and experience. And really at age 12, that's where it started. At Age 16. Um, I, you know, I, I actually had a pretty cool defining moment. I just started realizing this. I was plowing driveways. I bought a snowplow on a jeep and old old jeep paid $900 for it and I know the plow is worth 700, so you know how bad the car was. Speaker 3:5:15And I got up at 4:00 AM to go plow the driveway that I've been piling all winter and my car wouldn't start. And I thought, oh no, I got all these people that depend on me. And I called a friend of mine who had a brand new car, a big chevy blazer and a snowplow. And I said, look, I know you don't do driveways, but hey, if you'll do my driveway this morning, I'll give you all of the money. And I jumped in the car with them. He came over to pick me up and we did all the driveways. I made nothing. But guess what? I made sure my clients were happy. My customers were happy. So that's really where it's in my DNA. I guess from the time I was young, so 1993, I've been out of college for about a year. I saw a couple of motivational speakers and I said, I can do that, and that's exactly what happened. Speaker 3:5:59I went to the bookstore, read a bunch of books, found out there was something called customer service, which resonated with me because of all the things I'd done, you know, by the way, just give you a few highlights, but that was the way I was, you know, I worked at a self service gas station. If there was an elderly person, I would go out and pump their gas even though we're self-served didn't have to. It's because it was the right thing to do. So that's what I did. And then I just started teaching about it and writing about it and speaking about it and that's where we are today. Thirty five years later. You think I was much younger because I'm so damn good looking. Speaker 3:6:33It's a, you know, it's been a good run here. I think I got another 10 years or so left, maybe 15. I don't want to be the old cute man on stage, but I love it and there's really three areas that I, I make a living at. One is I do keynote speeches at events around the world. Uh, number two, we have a training company and we have trainers that actually deliver all my content at a much deeper dive. And then on the big, the big fun thing is I write books, you know, I'm working on number seven. It's coming out October second, again, another, another level of customer service and experience. I think this is going to be one of the most powerful books I've written because nobody has written about this. So, um, I'll let you decide if you want me to talk about it or please do shut. Speaker 3:7:19Go ahead. Please let us know it's theirs. I noticed there's some great companies rock the rock star companies in customer service. If you look at an overwhelming majority of them, they do one thing that completely disrupts their competition. It's not that they're just better, it's they're better at service, but one area of service they really excel at and that is they're more convenient to do business with and who's the most convenient company on the planet. I'll see if you know the answer to this. I mean, I'm going to have to make a guest that Amazon's pretty dark dean being that is the answer and, and they're, they're. You think about what they've done. They've created a system, they disrupted an entire industry of books and now they disrupt the entire retail world because what they do is, is you know, and by the way, everybody thinks Amazon's the least expensive and you save money with Amazon. Speaker 3:8:12You do save money, but not as much as everybody thinks anymore. It used to be it was a big discount and in some areas it's still is, but you know what they will even share with you. This item you're looking at can be bought from another retailer who by the way is part of the Amazon marketplace. Yup. It can be bought at less for less money. But guess what? It's amazing how many people say, Nope, I'm going to stay with Amazon because I know I can count on them and it's easy. One Click ordering. You just click on the item, boom, it's there, it's delivered, you know, two days later, if you have a prime membership, they have a button that fits, that adheres to the side of your washing machine at home. And when you run low on detergent, you push the button and detergent shows up tomorrow. Speaker 3:8:54They, they have a subscription service now where you can subscribe and save when you, when you subscribe to receiving something every month or every week at the same time, they will give you an incentive to do so. Um, you know, there's, they just are so convenient and so many different ways. Uh, so the six areas of convenience, real simple in every company can have at least one if not multiples of these. There's first of all reducing friction. That's a given. But some companies have made it like close to their entire value proposition. So I want you to think about Uber and lyft. Companies like that. Uber being first to the market, they disrupted the cab industry. How so much more convenient. You don't have to pay when you walk out, you just walk away and it magically a charges to your credit card. I mean, that's so easy. There's technology companies like pay pal made it really easy to move money from one from your account to someone else and then there's of course venmo and all the others, but there's companies that use technology to create an ease and convenience, self service. Think about the companies that are using self service and I'm not just talking about self service, customer service and the. Of course you go to a grocery store, you got checkout lines where you can now go and check out yourself. It's faster. You learn how to use the system. But how about the airlines? It created online, checkin so much faster and quicker than having to wait in the line. Uh, the company that I use as a main case study is Pinera. Do they have a Pinera where you live? Speaker 3:10:26Over the last several years, Pinera has moved into a self serve where you can go into a kiosk, you don't have to wait in line, by the way, by going self-served they didn't cut employees. They allow those employees to better serve their customers. So, but I can go on, on about Pinera delivery. My car dealership will actually bring my car, uh, bring a new car to me when my car needs an oil change. I don't have to bring it in. And the guy said, when you come back to my dealership, it will be to buy a new car, not because you need service, we take care of you, we come to you for the service. And there's so many different companies that are using delivery, uh, as a great tool and access. How close are you to your customer? Are you open 24 hours? Are you open? What are your, you know, I use Huntington Bank as a bank, uh, that is open beyond traditional banking hours so that their customers who work can come in after work or on the weekends. Sure. So anyway, those are some of the ideas and areas and I think it's one of the hottest opportunities for a company to disrupt a competitor and people even pay more for convenience if it's done right. So anyway, I can talk more about that. I can. Big thing to be thinking about and talking about. I'm living at 24 slash seven right now. Speaker 2:11:41No, the chef, you're absolutely right. When you look at the big boys right now, the biggest companies in the world that are changing the way that we live our lives in the way that we consume. You're absolutely right. The one thing that they all have in common, it's they make it easy to buy from them. They make it easy to consume their products and their services and then they make it easy for us to want to tell all of our friends about how great it was to go through that with them. So you're absolutely right. I'm shut. I'd love to take a couple minutes to talk with you about the foresee cx success pillar. So as you know, we spent a ton of time here on the show talking about team rules, process and feedback, stuff that you live and breathe every single day of your life. I'd love for you to chat with the [inaudible] nation. About which of those four pillars do you tend to spend the bulk of your time with when it comes to, to working with your clients and some of the companies that you're consulting for. Speaker 3:12:34Why are you asking me which of these four do I spend most of the time when? Speaker 2:12:38Yes sir. Which of the four cx pillars? Speaker 3:12:40Yeah. And I'm looking at them and Gosh, you know, I would say it depends what you call tools. Uh, I would say the tools are the natural, uh, so, uh, and I, and the reason I struggle with this as people would say tools. Oh, that could be, you know, artificial intelligence can be software. But I wrote a book about three years ago called amaze every customer, every time, 52 tools to create the most amazing service on the planet tools. So why did I use that word? Tools, because really what they are, their tactics and they're the things that if you do business with somebody, you're going to say, wow, I'm really glad they do that. And um, you know, they can be strategic in a sense a or leadership based or they can be a very tactical like your frontline actually interacting with the customer. But um, I call them tools because I used ace hardware as a role model and a case study throughout the entire book. It's not a book about them, but it's an example of how a little guy beats up or beets and winds and thrives and in the shadow of these big box stores. Yep. Uh, so it's like David versus Goliath. So I probably spend more time on tools and anything, recognizing the tools are ways to deliver service, whether it be software or whether it be actually soft skills. Speaker 2:14:03That's great. No, that makes perfect sense. That makes perfect sense. And again, any team that he's going to push their business to the next level, they have to have the tool kit that gets in there. I mean, it's, it's one thing to get your business up and off the ground in the first place, but to get, to get it humming along and to get it really, really scaling and growing for the future tools is going to be one of the biggest, one of the biggest aspects in delivering that. So spot on ship. Um, in terms of. I'd like for, to kind of get your idea. So a lot of the lot of the folks listening to [inaudible], we've got a lot of customer experience, customer service, um, professionals folks that are, that are living and breathing this world every day. They're working with customers, they're figuring things out and really they're trying their very best to amaze, amaze their customers and to really kind of make sure that they're doing everything they can to come back. What is some advice that have for some of the start founders or younger executives or, or even small business owners who listened to this show when it comes to getting their business or their early customer base off the ground? Speaker 3:15:05Wow. Well, as it applies to customer service and experience, I think number one is always keep the customer in mind with every decision that you make. That's what I call customer focus. And what that means is that every time you are getting ready to create a process, um, do a, uh, a product or a product change, you should say, how is my customer going to feel about this? How is this going to impact the experience and give you an example. Some of them are going to be, oh, they're gonna love that I have more product or more colors of this product. But what happens if I raised the price? How are they going to feel about that? While they're not going to be happy about that, but that doesn't mean I don't do it. It just means I'm going to make a conscious decision to do something. Recognizing how the customer is going to feel about it. So I'd say first and foremost is to become customer focused. Speaker 2:15:58Okay. And then when you, when you, when you become customer focused, what are some of the, uh, some of the easiest opportunities or see the easiest areas that you've seen to get that feedback from your customers? Speaker 3:16:11Yeah, and it's not even so much about the feedback to start with. I want you to identify what the company to identify every single touch point that the customer is going to have in the experience, not just in the service interacting one on one with a team member, but actually what's the entire experience going to look like? It may start out with them being on a website. It may move to them going to a contact form. It may then go to a followup phone call, uh, and how has that fall? And then there's an appointment that said, and I, I mean, there's so many different ways or it could be a straight retail transaction, but I want everybody. I want number one, the, whoever's running the organization, big or small as even as small as two or three people is to recognize we're all those touch points are. Speaker 3:16:59And then there's a second area, I call it the impact points, what's happening behind the scenes. And the example is if you check your bag on an airline trip from St Louis to Los Angeles and I see my bag go down the conveyor belt and four hours later I'm in Los Angeles and I say, see it show up on the carousel. There's probably 20 people that touch that bag between then and now. And uh, that's the impact they have behind the scenes. If somebody doesn't do their job, that impact point x, you know, just explodes. And then, uh, the touchpoint at the, at the end is not a positive experience. So impact points, touch points. And what that allows a company to do is recognize that everybody in the organization, every department somehow is impacting the customer experience. So feedback wise, when you're on the frontline and you're on that, that touch point and you're actually interacting, it's great opportunity to ask your customers. Speaker 3:17:53So it could feed back one of two or three ways. I always say, just ask and if you're in the interaction, ask if it's, if it's not an interaction that you can ask to it shortly after that interaction. So, uh, I've received surveys a week after I've done business with somebody and by that time I'd forgotten all about them. Me To absolutely do it know, and you don't necessarily need to do it in one minute, but it shouldn't be a week. Maybe it's the next day. Once you, the further out you get the less opportunity to get it, to get the feedback. Number two, make that feedback easy for them to give. Don't, don't give them feedback, fatigue, survey fatigue, if you will. Um, you know, my car dealership, the one that I love so much, I still love them, but I'm not answering anymore. They're darn survey tired of they beat me up the first time with a 25 minute survey and it's like I'm not gonna do that again, but they wanted me to too damn bad. Speaker 3:18:49If they want your expertise yet they know that you are a specific type of client that they need to get that feedback on. Yeah. And fine, then pick up the phone and call me. Don't make me go from screen to screen to screen after I've already filled it out the first time. The second grade boy, it's a grand point. And again, a lot of the folks that are listening to this right there, there they are running these customer experience teams and startups where they're literally trying to figure out each and every day what is the best way of getting this customer feedback. Is it a phone? There you go. That's what it look. I've spent my entire career talking with my teams that way. Pick up the telephone and call someone. It is the best way to get a true sense for how they're doing. Speaker 3:19:26More importantly for, for, for folks, it's just easier to talk about convenience shut, right? Make it easy. So American Airlines, uh, that's my airline of choice. I fly on them. And by the way, I love a lot of airlines do. Who Do I think is the best airline I, I'm. Even though I find the most, I'm not going to say it's American. I think southwest does an amazing job. You know, I, I still love American, but when you look at the day in and day out, who's more consistent, but what American Airlines did that was really cool is about a month or so ago, I received a phone call and they said, look, we're, we're not actually here asking for a survey. I worked with this special department. I can't remember which department it was. There's maybe eight people in this department. And she says, we just want your feedback. You fly on this a lot. Speaker 3:20:12What are we doing right? Where can we do better? And I said, I am so glad you asked. Um, but you know what, I don't have time right now. What I'd like to do is really think about this, make some notes and call you back if you really want to hear they, oh, we absolutely want to hear. And she said, if I'm not here, I'm going to give you the number when you call in. There's only a few of us on this team. So you'll talk to somebody and they'll know who you are. And of course I called. She wasn't there. And the person said, Oh yeah, I see you talk to so and so. Um, so, uh, you wanted to make some notes, we'd love to hear them. And I went through a list of all the things I thought were great in the few areas I thought were opportunities to improve. Speaker 2:20:50That's awesome. That's great. Now it really, it's huge. And again, for the, for, for some of the, for some of the folks that are running these younger businesses are listening today, getting that feedback and thinking about how you can inject it back into your product and your service offering. It's going to be key to the future success of your company. So I love it Jeff. Great stuff. Alright, I have some fire round questions for you sir. Coming in. Ready? I'm sitting down. I'm, I'm bracing myself. Excellent. Excellent. All right, so here's the deal, everybody that comes on to the show, we asked them this question and the net of it is this, we would like to know the cx nation would like to know what is the most entertaining customer interaction that you've had in your career? Speaker 3:21:32Well, you can just go on my youtube channel and hear me talk about the cab driver's story. That was just an age thing, but I'm not going to take the easy way out and and by the way, Shep TV or Shep Shep TV.com or [inaudible] dot TV takes you straight to the youtube channel and there's a cab driver story that I tell did I promise will make you laugh and want to share with your team, but here's what happened the other night and it was an entertaining story and the most amazing like, can you believe I can't make this crap up? Okay. We go to a fancy fancy steakhouse, the salads like $14 and it's a regular plain salad. There's two people that order my buddy. His salad gets dragged down by the server service, sets it down and it's like half on the plate and it's like, where's the rest of the salad? Speaker 3:22:21It looks like he lost half of it and the other salad of course is full and nice looking on the plate and my buddy says, excuse me, but, but there must be something wrong. I ordered the same salad she did, did I? Is this like a half salad and the most entertaining line came out of the servers, mouth. I don't make them. I just serve them. Man. Did she know who she was saying that it was he and and stunned us in the silence. It's like, oh my gosh, I can't make this up. This is the person walks away. We have a very entertaining conversation around that line and it was just amazing. I talked to the manager about it, the manager, one of the compromise meal. After that I said, you don't need to even think about giving us anything for free. That's not why I complain or tell you anything, but what I would like to do when I'm finished with dinner because I like to tell you all of the things that went well and didn't go so well and I sat down with them afterward for about 15 minutes and he was very appreciative. Speaker 3:23:23I told them what I did and we were really nice about. He says, I want you to come back tomorrow night. I want to take care of you. I said, well, I don't know what taking care of me means, but I'm probably not coming back tomorrow night, you know, ironically, that's where my friends wanted to go back, a different set of friends. So I did go back and we had an 8:00 reservation and I went upstairs at o'clock when the restaurant open, I sat down with the manager for about five minutes. This is, this is what we're going to do tonight. Okay. And this is who my team is, who my friends are. These are really high profile people, New York Times bestselling authors, worldclass consultants, and we can't screw this up tonight. And, and uh, they did a phenomenal job and they gave us a free appetizer and need it. Didn't want it. It was a little touch. It was nice. They didn't have to buy an entire meal. They didn't even have to do anything other than just blow us away this time. And they did. Speaker 2:24:18I love it. Shut. You know what's great about that story though is like, this is a literally a perfect example for how when any business or any business owner right takes the time to ask how, how it went, how could we do better, what can we do different? How do I make sure that you come back the next time and you guys went through that process and he literally got that second chance. Although it was probably state, it sounds like stakes even a little bit higher and they killed it. They did it for you guys. They worked in literally. It's a, it's the, it's the beauty and the power of, of, of the full circle feedbacks. That's awesome story. Speaker 3:24:52Well, thank you. Thank you very much. And they didn't have good job and you know what I hope to go back and hope with a manager or remember who I am and, and, uh, just give us another great experience. The funny thing is he says, and I'll make sure you don't get the same service. Speaker 2:25:04Thank you very much. To put on the other side of the restaurant. You put, um, put on a different floor, please. That's awesome. Well look, so to wrap up the show, chef, I want to make sure that you have some time to highlight anything that you'd like to pitch or to chat with the CX nation about upcoming events, conferences, books, how and then most importantly, how our listeners can get in touch with you so that they can keep the conversation with you as well. Going into the future. Speaker 3:25:32Sure. Well this is easy hike and that come easiest way to stay with me know, get my newsletter. It's free. I, I do fun cartoon every week. I do a great customer service tip every week. I promise you it is value. It's not promotion. I'm speaking of promotion. I already talked about the book the book's called the convenience revolution. And the subtitle is how to deliver a customer service experience that disrupts the competition and creates a fierce loyalty, which is what we want. Uh, I talked a little bit about that at the top of the show. If you go to be convenient.com, that's b convenient.com. And you preorder the book book comes out in October. You will, uh, I will, first of all, you just paid for the book and we'll pay the shipping and attacks. It'll come from Amazon, barnes and noble, a ceo read one of those retailers, but today, if you're not just anytime you pre ordered, if you preorder anytime before October second, you will automatically get the ebook free and it's immediate. Speaker 3:26:30So the, the book is finished, it's actually at, the publisher says it's at the printer waiting to get printed. So we have the ebook available and instead of selling it to you through Amazon, we will give you a link and a, just you on it. It opens up, boom. You've got the book you can download to your computer or whatever you want to watch it on or read it on and it's like our gift to you. So I'm very excited about that. And um, I, I think it's, there's nobody that's written a book on this topic of the closest thing is the effortless experience. Sure. Which by the way, it's a great, great book. Absolutely love that book. But that's just about one aspect of, you know, the customer service and experience. This is about really a strategic look at what you can do and then there's tactical ways to make it happen throughout your entire organization to be known as it convenient company by the way. There's a reason they call it convenience store convenience store because it's convenient. So what can we do to, to earn that title for our from our customers. Speaker 2:27:31I love it. I love it. Well, first of all, I look forward to reading the book myself in the very near future. And second of all, I think that that's an awesome party note for the CX nation, which is how can you make things more convenient for your customers? It makes perfect sense and it's something that each and every one of us should get back to work on this week within our own businesses and with our own customer base is to make it happen for the future. So this has been an absolute pleasure. I'm so happy that you were on the show. Thank you so, so much for your time and for speaking with all of us. It's been an absolute pleasure. Speaker 3:28:02Well, thank you so much. It's been my pleasure. And, uh, stay amazing. Be Amazing and be convenient. Speaker 2:28:08Thank you so much. We appreciate it. Speaker 1:28:16Thank you so much for listening to another episode of Cx chronicles. Be sure to subscribe and save and share with all of your fellow cx. And until next time, make happiness a habit. CX Station, check us out at cx chronicle stock car. All content © 2019 CX Chronicles Podcast.